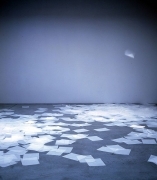 Sean Kelly Gallery is pleased to announce an exhibition of new works by Ann Hamilton. This is Hamilton's first solo exhibition in New York since she represented the United States at the 48th Venice Biennale in 1999. Hamilton's exhibition is comprised of a site-specific installation in the main gallery, which was conceived on her first visit to the new gallery a year ago, before the space was renovated. Also on exhibit in gallery two are a group of new photographic works from an ongoing series made using a small pin hole camera designed by the artist which she places in her mouth. These fascinating works pursue and extend Hamilton's preoccupation with the mouth, the source of communication and language, and strongly evoke the performative aspect of the making of the photographs. They also make powerful allusions to the spectral presence and absence of "sitters" whom have been a consistent preoccupation in Hamilton's installations over the last twenty years. In the project room a video, untitled (lumen-hand/ring), depicts someone using a mechanical wooden hand with which they attempt to grasp an elusive ring floating in front of them. Ann Hamilton was born in Lima, Ohio in 1956 and received a Masters of Fine Arts from the Yale School of Art in 1985. She has created major museum installations for The Museum of Contemporary Art, Los Angeles; The Hirshhorn Museum and Sculpture Garden, Washington D.C.; Dia Center for the Arts, New York; The Museum of Modern Art, New York; Tate Gallery, Liverpool, England; the Institute of Contemporary Art, Philadelphia; The Art Institute of Chicago; Wexner Center for the Visual Art, Columbus, Ohio; The Stedelijk Van Abbemuseum, Eindhoven, The Netherlands; Contemporary Arts Museum, Houston; Le Musee d'art Contemporain, Lyon, France; and Miami Art Museum, Miami, Florida. Hamilton's work is included in many major public collections worldwide including: Solomon R. Guggenheim Museum, New York; The Metropolitan Museum of Art, New York; Miami Art Museum, Miami, Florida; Musée d'Art Contemporain, Lyon, France; Musée d'Art Contemporain de Montréal, Montréal, Canada; The Museum of Modern Art, New York; National Gallery of Australia, Canberra, Australia; Tate Gallery, London, England; Whitney Museum of American Art, New York. Commissioned projects have included Mess Hall, Headlands Center for the Arts, Sausalito, California; San Francisco Public Library Commission, The Arts Commission of San Francisco, San Francisco, California; Pittsburgh River Front Park, The Pittsburgh Cultural Trust, Pittsburgh, Pennsylvania; Teardrop Park, Battery Park City Commission, New York, New York. 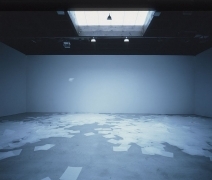 In 1991 Ann Hamilton represented the United States at the Sao Paulo Bienal. She has received Guggenheim, Louis Comfort Tiffany and National Endowment for the Arts Fellowships and a Wexner Center for the Arts Residency. In 1993, she received the prestigious John D. and Catherine T. MacArthur Foundation award. She was the recipient of the Aldrich Award for 1997 and was the subject of a solo exhibition at the Aldrich Museum of Contemporary Art, Ridgefield, Connecticut in 1999. Hamilton has forthcoming museum projects in America, Ireland, Sweden and Japan. She was selected to work with Dutch architect Rem Koolhas on a large public library project in Seattle. This spring Harry N. Abrams, Inc. will publish a comprehensive monograph on Hamilton by Joan Simon.